•	A relevant Bible verse. •	A brief story related to waiting in a health care crisis. •	A gospel reality that brings peace and hope. •	A brief concluding prayer. •	One or two suggestions for further action—Bible reading, links to music, reflection questions, other calming activities. Elizabeth Reynolds Turnage, M.Ed., M.ACS., is an author, teacher, and story coach. 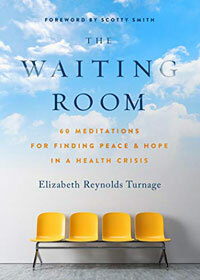 When her son was diagnosed with a brain tumor while her father was also dying of prostate cancer, Elizabeth Turnage became a cancer caregiver, spending many long spells in many different medical waiting rooms.